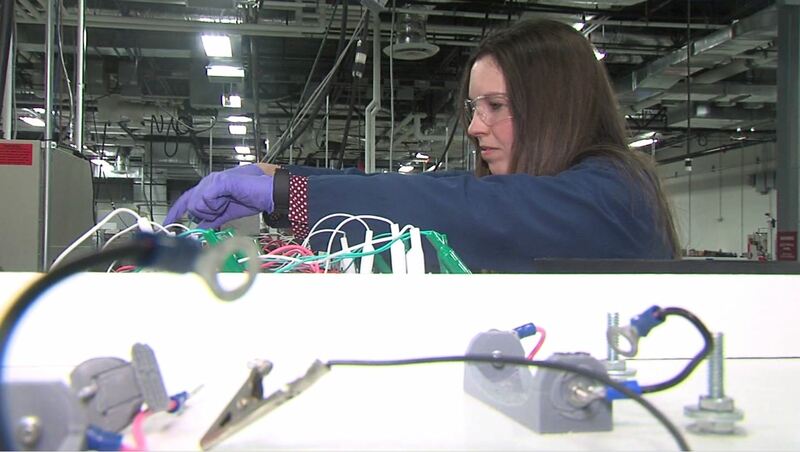 NEWBERRY — Ashley Gordon is focused on improving the next generation of battery power. You'll find her in the Battery Innovation Center in Newberry in Greene County. She's been there since August 2014 — after spending a year in Australia focused on energy-related projects. Ashley is now an advanced battery manufacturing team manager. "When I think of the word engineering I think of problem solving and developing the next thing," Gordon said. "You can build a bridge you can design a car you could construct the next airplane they could take you faster abroad overseas around the world." The Virginia Tech graduate said at conferences she's often among the few women in the room. That is something she said needs to change. As a young girl, Gordon remembers her parents encouraging her to embrace engineering because she liked math. "I think because I was looking for something different I did go abroad," Gordon said. "To find a job, there are a lot of options you have career fairs, a lot of companies coming even big names you can talk to like Cummins, General Electric like GM all types of car companies, energy companies, there are a lot of options. "It can be a little overwhelming when you have the education background there are a lot of options so it's about defining what you want to do. Then that's what helps you decide on what job career direction you're going into." But she said more needs to be done to get women in high-paying jobs. "I think getting introduced to what it means to be an engineer sooner," she said. "So whether it's taking tours of facilities like this or other ones where they're designing and creating new things or if it's having folks come in and do career day and really explaining. I didn't get a lot of that growing up I didn't know what the jobs were." The organization is marking its 20-year anniversary on Aug. 16. The event will celebrate the past decades highlighting Women & Hi Tech members who have advanced the cause and careers of women in STEM in Indiana through their contribution. The group is also awarding $20,000 in scholarships to women pursuing degrees in STEM in Indiana and plan to stay in Indiana after they graduate.